Tag line: "FOR PEOPLE WHO WANT TO DIE LAUGHING!" 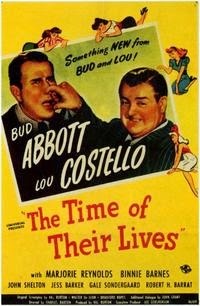 Abbott and Costello’s 1946 film The Time of Their Lives opens in 1780, five years into the American Revolutionary War. Nora (Anne Gillis), an indentured servant of nobleman Tom Danbury (Jess Barker), is being wooed by Cuthbert Greenway (Bud Abbott), a butler on the Danbury Estate. Unfortunately for Greenway, Nora is in love with Horatio (Lou Costello), a master tinker. Ever since the war broke out, Horatio hasn’t been able to make a decent living, but that will soon change thanks to a letter of recommendation signed by General George Washington himself, praising Horatio’s skills. In her excitement, Nora takes the letter and rushes to show it to her master, Tom Danbury, as well as Danbury’s beautiful fiancé, Melody Allen (Marjorie Reynolds), in the hopes they will grant her freedom so that she and Horatio can be married. What Nora doesn’t realize is that Tom Danbury is a traitor working to undermine the Colonial war effort. While making plans with two associates, Danbury discovers Nora has overheard them, and as his compatriots rush the panic-stricken girl out of the room, Danbury grabs Horatio’s letter and hides it away in the library clock. Unbeknownst to Danbury, his fiancé Melody also overheard him. In an effort to thwart Danbury’s plan, Melody asks Horatio to take her to General Washington. Alas, as Melody and Horatio ride off, they’re pursued by American soldiers who, having come to arrest Danbury, mistake the two for traitors trying to escape. A chase ensues, and Melody and Horatio are shot dead, their bodies tossed into a nearby well. As a result, their spirits are bound to the Danbury estate, forced to dwell there until they can prove their innocence. For nearly 170 years, the spirits of Horatio and Melody have wandered these grounds. Then, in 1946, something remarkable happens: the long-dilapidated house once belonging to Danbury is restored to its former glory by a man named Sheldon Gage (John Shelton), who even went so far as to purchase all of the house’s original furniture. Hoping to impress his fiancé June (Lynn Baggett), Gage invites her, along with June’s Aunt Millie (Billie Barnes) and the family psychiatrist Dr. Ralph Greenway (a descendant of Danbury’s butler, also played by Abbott) to spend the weekend at the estate. Seeing this as their last chance to rid themselves of the curse, Horatio and Melody begin searching the house for Horatio’s letter of recommendation, which will prove they weren’t traitors. Of course, their presence in the estate doesn’t go unnoticed, leading Gage and his guests to conclude that the place is haunted. Will the two spirits find what they’re looking for, or are they destined to remain on earth until the end of time? This may sound like some pretty heavy stuff, but rest assured that The Time of Their Lives is played 100% for laughs. Despite the fact he’s a ghost, Costello’s Horatio never learned to walk through walls, leading to a number of pratfalls as he bangs into doors and trips over furniture. Even as a spirit, Costello remains in perfect comedic form, yet what I liked most about The Time of Their Lives was how it exploited the ghost angle to its fullest, showing us a haunting from the perspectives of the victims as well as the ghosts themselves. At one point, Gage’s maid, Emily (Gale Sondergaard), who fancies herself a medium, holds a séance to find out what Horatio and Melody are after. As she begins the ceremony, the two ghosts are resting in a tree just outside when, all of a sudden, they’re drawn to the house, unable to resist the force that’s pulling them there (Emily’s séance). Several times throughout the movie, we're shown what's happening in both the spirit world and the real one, including how the occasionally innocent actions of the ghosts are sometimes mistaken for devilish pranks. In one hilarious scene, Gage, Greenway and the others are sitting in a room trying to come to terms with the "haunting" when, quite unexpectedly, the lights flicker on and off. Convinced it’s the ghosts toying with them, the group begins to scream, but what they don’t know is it’s all being caused by Horatio, who, while searching for the letter in the basement, accidentally shocked himself on the estate's generator! A funny movie that also brings some ingenious material to the table, The Time of Their Lives is easily Abboitt and Costello's cleverest film.